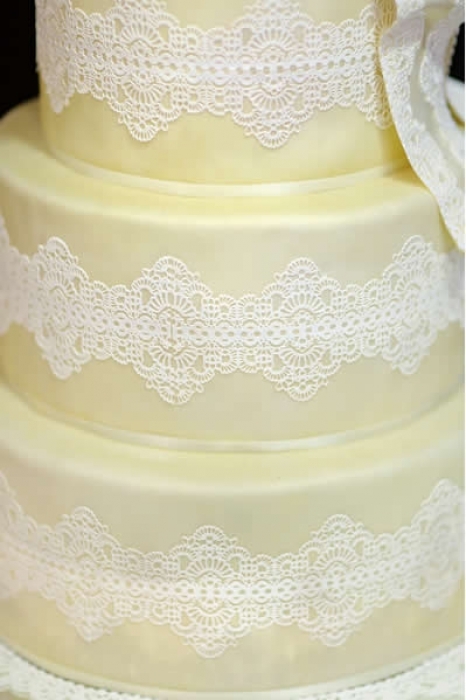 Professional Sugar Lace in white is a flexiible cake lace which is very easy to use. Simply make to manufacturers instructions, spread onto the mat and place in the oven at 80°C. Bake for 12 to 15 minutes, take out of the oven and cool for five minutes, it is then ready to use. From start to finish your Sugar Lace could be ready to use in less than 30 minutes. The beauty of this Sugar Cake Lace, once it has been made, is that it will stay moist and pliable for many months to allow you to create masterpieces that may take a period of time. Sugar Cake Lace comes in a 2 separate parts, Part A and Part B. Please note that Part B is included inside Part A. Suitable for vegetarians and nut free. 1. Place 50ml of water into a food mixer. This doesn't have to be specifically hot or cold, just water from a tap is fine! 4. Add half a teaspoon (2.5 ml) of Part B (liquid) - Please note that Part B is included inside Part A. 6. Pour some Sugar Cake Lace mixture onto the mat and spread with the Cake Lace knife. 8. When the Sugar Cake Lace is ready to be released, place face down on a greaseproof paper. Release with help from the knife. 9. To adhere the Sugar Cake Lace to your cake use a little water straight onto the covered sugarpaste cake. Place the Sugar Cake Lace on and press gently. 10. Any Sugar Cake Lace mixture that is left can be stored in the refrigerator for up to 7 days. A small amount of Part B liquid will be left over, this can be optionally added to create a softer lace. 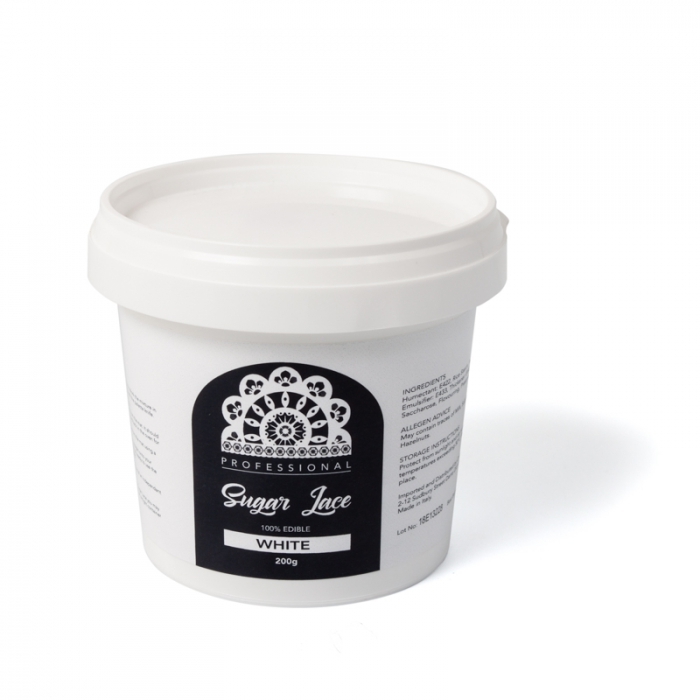 Sugar Cake lace will remain pliable for many months, transporting your cakes will be a breeze. Sugar Cake lace can be coloured using powder or gel pastes to achieve pastel colours. Airbrush or spray to achieve dark colours. We recommend storing the finished Sugar Cake Lace in some grease-proof paper, wrapped closely. Then wrap that in foil, and store away from strong lights and odours.